The sweet smell of roses presents an overwhelming reason to start a rose garden. Some roses bloom for several months at a time, and have a strong and beautiful scent. Not only The sweet smell of roses entice you to start a rose garden but the beauty and color of roses. . Roses symbolize love, beauty, war, and politics but mostly love. Poets have written about the rose, singers have penned songs in its owner. But the Rose stands on its own as a testament to the greatness that is nature. The rose that carries the name of William Shakespeare is an extraordinarily beautiful rose. 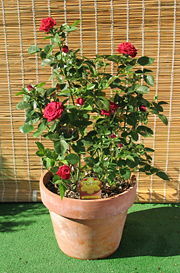 There are several categories of roses. This particular species is a shrub rose. The bloom is very large and very fragrant. The individual blooms are 4 inches across and have full petals. The rich fragrance has a hint of the smell of violets. This a beautiful much sought after rose. However, the rose requires a high maintence gardner. 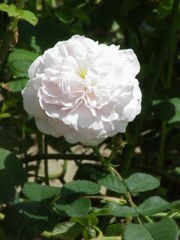 ‘“William Shakespeare’ is one of the Austin roses that has been relegated to the “collectors item” group. This shrub produce some magnificent blooms. If you are willing to give this rose the special care it needs, it can be a most beautiful rose. There are as many variations of roses as there are reason for stating a rose garden. The decision comes down to what are your personal preferences With such a large choice for the kinds of roses you can grow, the real choice is how much work are you willing to devote to growing roses? The following questions can be answered to make your final choices. What colors do you like best. Choose the color of roses based on your preferences for color and combinations of colors. You can match the surrounding scenery. You can create a unique new color scheme. Roses come in so many variations of color that your choices are unlimited. Surprisingly, size is a consideration when choosing roses for your garden. You want to calculate the height that the rose will be at maturity. Some roses bushes can grow up to fifteen feet in height. Will your fence or house accommodate this size? If space is limited you can always choose miniature roses. Decide the climate requirement for the roses of your choice. The rose catalogues will provide you all the information you need to make a wise choice regarding the ideal climate for the rose you want to grow. Choosing the right roses for your particular climate and soil conditions is a very important consideration. Purchase roses that can accommodate the climate where you plan to plant them. Maintaining your rose garden will be easier if you have taken the color, size and climate requirement into consideration. Some roses are bred to be very disease resistant. Although the William Shakespeare Rose is a very beautiful roses, it is not disease resistant and would not be a good choice for a low maintenance rose garden. A new rose landscaper may want to choose landscape roses as your first project. Landscape roses are easy to care for and disease-resistant. These roses will grow lush petals. The will grow up the garden trellises to enhance the beauty of the area. Add climbing roses to the landscape roses to create a beautiful and colorful landscape. Although climbing roses look similar to landscape roses, climbing roses have been trained to grow upward like vines. Your first rose garden will a beautiful tribute to the Barb.